“Make the salad,” my mother ordered. I chopped up iceberg lettuce and added tomatoes, sliced a hard-boiled egg and added onions. One summer night, my father’s friend added the task of making blue cheese dressing . “Start with a half cup of sour cream, add a tablespoon of mayonnaise, a dash of Worcestershire sauce, juice from half of a lemon, a few shakes of garlic powder, and crumbled blue cheese.” My father loved the dressing so much that from then on I had to make it every night along with the salad. I can make this salad and dressing with my eyes closed. This little iceberg salad was not the main dish, only a side, and for many years it was the only salad I ever ate. My mother made dinner for us every night under the same scenario: a protein (meat, chicken or fish), a starch (potatoes or corn), a vegetable, and the salad. I continued this tradition well into my adult years for my own family until my daughter decided to become a vegetarian. Salads are probably the easiest meal to make for a vegetarian. 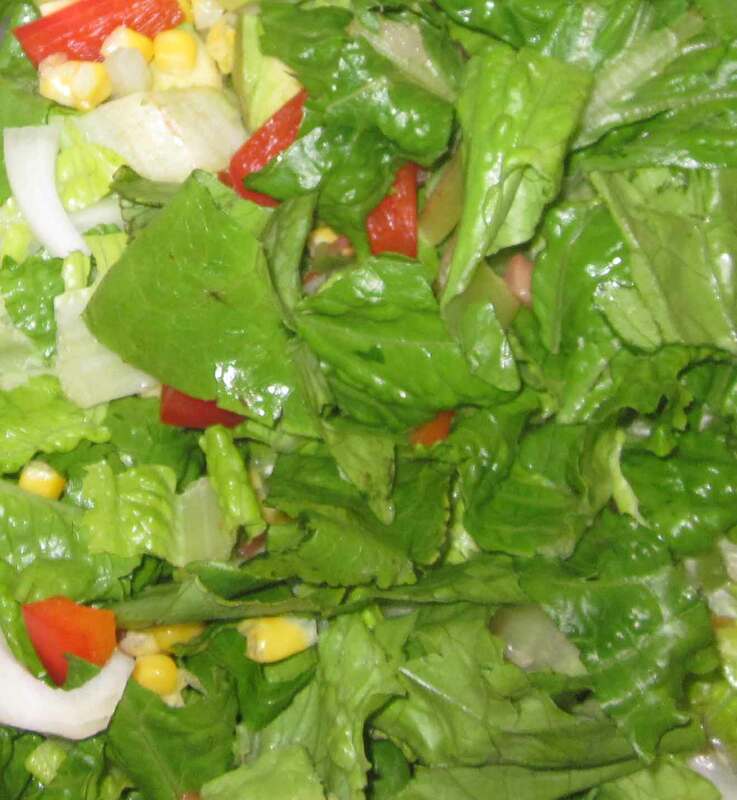 Nowadays, most people who plan to feed a large group will include a salad for those who prefer not to eat the common meat and potatoes meals. At many of these gatherings I still run into the old-fashioned iceberg lettuce salad which seems so dreary to me now I can barely eat it. There are tons of salad recipes on the Internet, but my favorite is the cancer-fighting one I often make for myself. I mix a couple types of greens: kale, arugula, endive, romaine, collards, or dandelion greens. In a dab of oil or a little broth, I fry onions and corn. In another frying pan I cook mushrooms in Bragg’s Amino Acids sauce or low salt soy sauce. This gives the mushrooms a distinct flavor. When these cool, I mix them in with the greens. I add chopped broccoli (or broccoli sprouts) and cauliflower, peppers , sliced avocado, sliced carrots, black beans, sesame seeds, and sunflower seeds. If you like some sweets in your salad, chopped figs or dates go nicely with the seeds. Served with a whole grain bread, this salad is a hardy meal in itself. It also contains the food groups my mother lived by: a protein (beans and seeds), a starch (corn and whole grain bread), a vegetable (broccoli, cauliflower, carrots, onions, and mushrooms), and a salad (all the greens listed). The salad dressing often is what makes a salad, but this one is so full of flavor it barely needs a dressing. Try a tablespoon of humus with it or one of the nut butter dressing on my recipe page for added protein. We often grow up with a standard recipe for religion, a sort of side salad that never changes. Later, we begin to ask questions and doubt what our elders taught us. Many of us give up on religion entirely finding it to be ostracizing, oppressive, and dogmatic. Like my dreary iceberg lettuce salad, religion can seem boring with the same set of instructions to follow. As we walk away from faith, religion can seem purposeless and even more in line with fantasy than reality, but a walk away from faith is a lonely walk. The best way to return to faith is to read about the person of Jesus Christ who is well-described in the New Testament. His life, the concepts he taught, his actions, and the stories he told can nurture our faith back to Him. The life of Jesus can illuminate our thinking and give us discernment about what is real and what is not. The life of Christ is an amazing story and filled with encouraging news about God’s true plan for us that can vanquish our worries, our loneliness, and our sense of dread and fear. Reading what Jesus said and did is often puzzling, strange, and shocking. The friends of Jesus, his disciples, are always so surprised by Jesus. They don’t understand him and are often asking him questions about what Jesus said or did. Then, after Jesus dies, these same guys are completely different. They know, they understand, they discern, and they create the very thing Jesus wanted: a group of people who believe in him, have faith in what he promised, and who worship Him through adoration and prayer. What happened to make these very same friends of Jesus that were so bewildered during his lifetime, such experts later? I believe God happened. He revealed His truth after the sacrificial death of Christ. He shined His light in the hearts of men and women and gave his greatest gift, God’s love finally understood and accepted. He continues to shine light into the darkness of our thoughts and fill us with His own love through the writings in the New Testament. The New Testament is written by the friends of Jesus, those known as his disciples who followed him around while he was alive, and worshiped him and preached about him after Jesus died. The New Testament writings give us a chance to sit at the feet of Jesus’ friends and listen to them tell about Jesus. Mark, Matthew, Luke and John all have stories about Jesus that they wrote down and are ours now to read. The other writings in the New Testament are actual letters these men wrote along with Paul’s letters, a man who persecuted the friends of Jesus until God shined his light and truth into his heart in a most miraculous way. These writings about Christ bring light into our dark world even today, and give us faith in His promise of a new world to come where Jesus will be ruler of all people. The Bible is God’s word and it never comes back to us void because it is not mere words we read, but power. So, don’t settle for a side salad religion, dig into the word of God and find a real meal.